There are so many options to choose from. 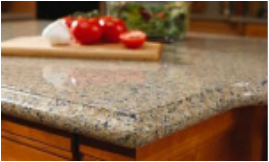 Solid surface, granite, quartz...we'll help you make the decision that's right for you. Solid Surface - We are a certified solid surface fabricator. Solid surface comes in a vast selection of colors to match any style. It's renewable, easy to clean and provides you with the option of a seamless undermount sink. 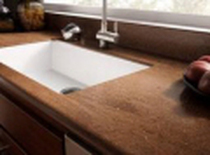 Solid surface is non-porous, perfect for the kitchen or bath. We do the measuring, we do the installation. You can rest assured it's done right. We fabricate all the major brands, such as Corian, Staron and Meganite. Quartz - Unparalleled durability and strength. Quartz is the 4th hardest mineral found in nature. 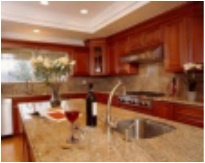 Quartz countertops are scratch, stain and scorch resistant. With so many colors to choose from you're bound to find one that's perfect for you. We offer Silestone, HanStone and Corian Quartz. Quartz is non-porous and requires no maintenance. Granite - Every slab of granite is unique and provides you with the opportunity to bring that uniqueness into your home. Granite is both beautiful and durable. Color options are endless, limited only by mother nature. Popular edge options include eased, bevel, full and half bullnose. Laminate - Easy to care for, affordable and so many options to choose from. No matter what your style, you're sure to find a look that's right for your project. Laminate offers a wide array of options. Solids to patterns, marbles to woodgrains. If you haven't looked at laminate lately, you're in for a surprise. It's come a long way!